Video has become an important part of the Facebook experience for people around the world, due in large part to the amazing creativity we’re seeing from all kinds of video publishers. To provide the best experience for everyone who watches, creates and shares videos on Facebook, we work with our community to understand which tools they want us to build. Based on this feedback, on top of the measures we already have in place, we’ve been building new video matching technology to further help rights owners protect the content they own. We’ve tested the beta version of this matching technology with a group of partners and have iterated and improved the tool based on their feedback, and we’re excited to make it available more broadly. 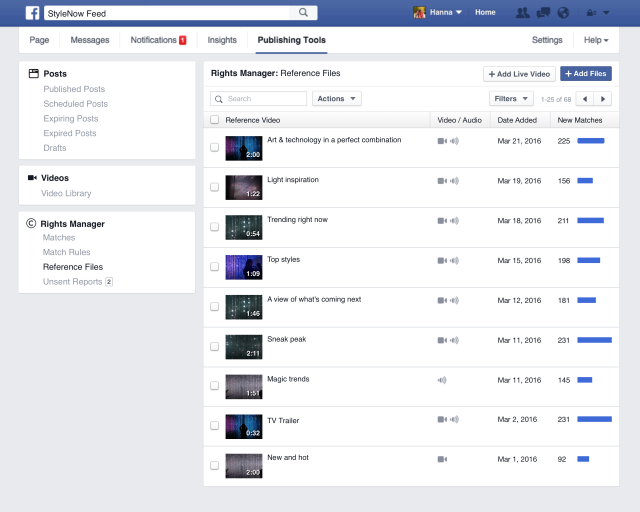 Today we’re announcing the launch of Rights Manager, a set of admin and workflow tools that help publishers and creators manage and protect their video content on Facebook at scale. With Rights Manager, we want to give video publishers the confidence that their content is protected across Facebook, as well as provide them with increased flexibility and greater control over the use of their video. Easily upload and maintain a reference library of the video content they want to monitor and protect. Publishers can upload content libraries and publish live video as references for Rights Manager to check against, including videos they are not sharing publicly on Facebook. Rights Manager then monitors for potential infringement of that content across Facebook. Create rules about how individual videos may be used. Publishers can set specific match rules to either allow or report copies of their videos based on criteria of their choosing—for example, how much content has been reused, where the matching video is located or how many views the matching video has received. Identify new matches against protected content. Rights Manager’s dashboard surfaces any new matches against a publisher’s uploaded reference files and live video. On the dashboard, publishers can filter matches by time, date or view count, and then either report potential copyright infringement or allow the matching content to remain published. Whitelist specific Pages or profiles to allow them to use their copyrighted content. Publishers can specify Pages or profiles that have permission to publish their protected content without being monitored for potential infringement. Protect their reference library at scale with the new Rights Manager API. We’re rolling out an API for Rights Manager to improve bulk uploading for publishers and to allow media management companies to support partners in managing, monitoring and protecting their content across Facebook. You can find out more about the Rights Manager API here. As more people watch and share live video on Facebook, we’ve taken steps to ensure that Rights Manager protects live video streams as well. 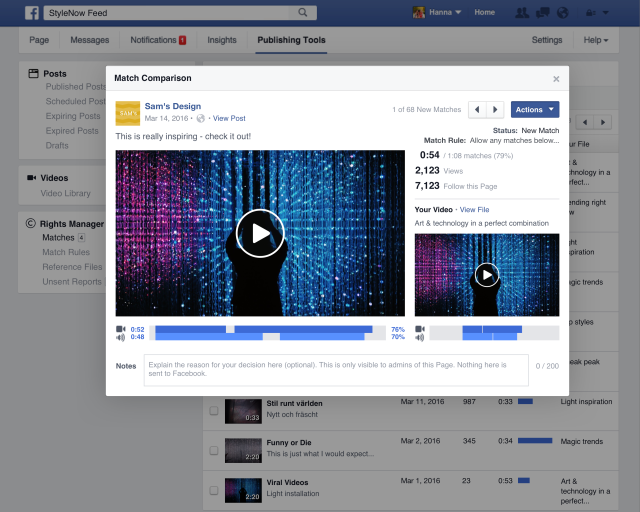 We check every Facebook Live video stream against files in the Rights Manager reference library, and if a match surfaces, we’ll interrupt that live video. Video publishers and media companies can also provide reference streams of live content so that we can check live video on Facebook against those reference streams in real time. In parallel with our work on Rights Manager, we’ve also made continual improvements to our IP policies, including our repeat infringer policy. We’re focused on building up our operations team to handle these IP reports, and we’ll continue to evaluate and improve our policies and procedures. Starting today, publishers will be able to apply for access to Rights Manager. To learn more, please visit rightsmanager.fb.com. This is our first iteration of Rights Manager, and we’re committed to updating and improving it based on continued feedback from video publishers. Many thanks to Facebook crew Analisa Tamayo Keef, Product Manager, and Lior Ben-Kereth, Engineering Manager for putting this info together.